If social networks were countries, which would they be? 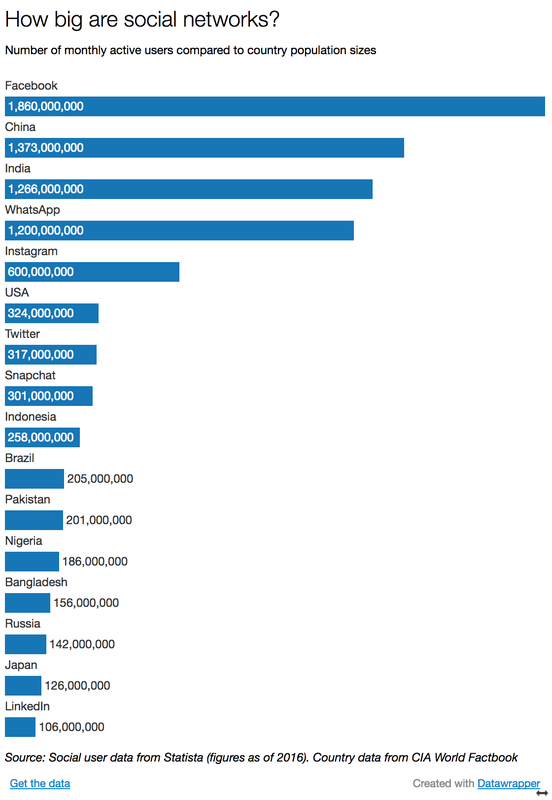 If Facebook were a country, it would be substantially bigger than China. The size of Facebook's user base translates to almost two in seven of the global population using it each month - around 1.9 billion people. The role of digital technology in breaking down physical borders is one of the many trends in the Fourth Industrial Revolution. As social media continues to open up new opportunities for businesses and societies, how do today's networks compare? According to Facebook's full year results for 2016, the social giant has increased the number of people visiting its platform at least once a month to 1.86 billion, up 17% year-on-year. By comparison, China's 2016 population was estimated to be 1.37 billion. Of course "monthly active users" isn't the best metric by which to measure Facebook's user base - if you don't use the website daily you arguably don't use it at all. But Facebook's daily active users figure has also increased 18% from 2015 to 1.23 billion. While not technically a social network, it's worth including the messaging giant in this list due to the 1.2 billion-plus people using it each month. Monthly active users isn't the best metric for measuring messaging apps either but the figure has grown impressively over the last few years, putting it within sight of India, which has a population of 1.26 billion. The messaging app also handles tens of billions of messages, photos, and videos each day. The photo- and video-sharing app reported over 400 million monthly active users worldwide in September 2015, which grew to 600 million by the end of 2016. Nearly all of these users are engaging with the service via the mobile app, although there is also a desktop version. The number of Instagram users in the US is predicted to pass 95 million by 2020. The network for those happy to keep their public musings to 140 characters or less, Twitter has over 317 million monthly active users, with around 80% living outside the US. Growth has slowed, as well as the company's stock price, but it's still the go-to place for breaking news alerts and a glimpse of the world in real-time. There are around 100 million people currently using LinkedIn each month. Over 400 million have an account, however. The social network generates revenue from 3 areas - hiring solutions, advertising revenue, and premium subscriptions. The 100 million MAUs puts it just behind the Philippines in terms of size. Snapchat has grown almost as fast as the number of updates it has released for its app... The youngest member of the social media giants (both by its audience's age and its own), it was reported back in January 2015 that over 100 million monthly active users used the app, which has now grown to around 300 million.